Session Four, Day Ten: The Final Show! We are always so amazed by the creativity and hard work our kids and teens put into their shows. As always, we are extremely grateful to have worked with this group, and will always remember The New Girl In Town and The Legend of the Travelling VonTacos. And with the end of session four, that’s a wrap for this summer’s KidsAct! and TeensAct! The kids and teens who we have been so fortunate to work with this summer are truly a special bunch. We are amazed at the talent and hard work we have experienced, and cannot wait to see everyone blossom into young performers, writers, directors, theatre-makers, and more. We hope all of you will continue to create and believe in the power of theatre! Author barringtonstagekidsactPosted on August 20, 2018 Leave a comment on Session Four, Day Ten: The Final Show! Session 4 Day 9 – Dress Rehearsal Day! With show day looming just a day away, levels of excitement were at an all-time high today. We spent all day refining and polishing our shows, adding in props and costume elements, and sharing the entire shows with the other group for the first time. This session has created two wildly different but equally fantastic shows inspired by their field trip to the Norman Rockwell museum, and we cannot wait to share them with their friends and families tomorrow! KidsAct! will be singing and dancing to “We Go Together” from Grease as well as “True Colors” and performing their suspenseful, hilarious, and fun-filled Legend of the VonTacos. Their play was inspired by multiple paintings at the Norman Rockwell and involves a horrible Swiss family band, a crazy meemaw, and a comical mix-up that leads to them being asked to perform for the queen of Russia. Will they get there, and what will happen if they do? TeensAct! will be presenting a poignant tale inspired by the painting “Moving Day” that explores the topical issues of embracing differences, confronting addiction to technology, and re-establishing human connection. New Girl in Town follows the journey of Rose, who has just recently moved to a new school, as she struggles to fit in and navigates a world of peers who are very different from her. This story incorporates the songs “New Girl in Town” from Hairspray, “Gorgeous” from The Apple Tree, “Popular” from Wicked, “Alone in the Universe” from Seussical, “This is Me” from The Greatest Showman, and “You Will Be Found” from Dear Evan Hansen, and it is at once comical, real, thought-provoking, and moving. We could not be prouder of all the creativity and hard work that went into the creation of these two shows, and tomorrow will be a bittersweet and exciting day as we finish off both this session and the entire summer and show off all we have accomplished over just two short weeks! Author barringtonstagekidsactPosted on August 17, 2018 Leave a comment on Session 4 Day 9 – Dress Rehearsal Day! Session Four, Day Eight: So Close To Finished! Excitement is running high at camp as we rehearse our plays in preparation for show day! At this point in our devising process, all there is left to do is rehearse, memorize lines, practice choreography, and continue learning our musical numbers. Today, kids worked hard on bringing their play to life, adjusting comedic bits, and adding energy to every scene. Teens were able to bring their scenes together, and work on musical numbers including songs from Hairspray, Wicked, and Seussical. Our kids have created a super-silly show full of adventure and surprises (which will take us all the way to Switzerland! ), while our teens have created a poignant piece which is ever-so-relevant in our current times and the rise of social media. Tomorrow will be our dress rehearsal and our last day to tie up any loose ends before we perform for our friends and families! We are so ready to focus, have fun, and ensure our show is the very best it can possibly be. Author barringtonstagekidsactPosted on August 16, 2018 August 16, 2018 Leave a comment on Session Four, Day Eight: So Close To Finished! We had another very busy day today, where lots of wonderful work was done that is bringing us closer and closer to show day! KidsAct! spent the day polishing the second half of their show, which is filled with potions and unicorns and is just as wacky and silly as the first half. We can’t wait to see it all put together! They also practiced both of their group numbers, nailing down the vocals for “True Colors” and perfecting both the vocals and the complex dance moves for “We Go Together.” TeensAct! reviewed solos, including “The New Girl in Town” from Hairspray and “Alone in the Universe” from Seussical, and figured out how to incorporate them into the storyline as a whole. They devised many new scenes, including an exciting homecoming dance for the climax of the story, and came very close to completing their epic tale. Both groups are ready to start rehearsing and refining tomorrow! Session Four, Day Six: Week Two Begins! Author barringtonstagekidsactPosted on August 14, 2018 Leave a comment on Session Four, Day Six: Week Two Begins! Friday marked the end of a crazy busy, but very productive first week! KidsAct! worked incredibly hard and was able to finish their play, which is a wonderfully complex and funny story about a crazy family and a Russian queen. There are so many wacky scenes and fun surprises that it is sure to be a great time! TeensAct! has also been hard at work on their play, which is developing into a social commentary on what it means to be popular, fitting in, and addiction to technology and social media. They have been creating powerful vignettes and monologues as well as working on ambitious solos and group songs like “You Will Be Found” and “This is Me,” and next week will be focused on bringing all the great work that has been happening into one cohesive story. Katy also worked on choreography with both groups. teaching dances for “We Go Together” to KidsAct! and for “This is Me” to TeensAct!. And finally, Friday was water play day! Everyone had a blast splashing around in the water and it was a great way to head into the weekend. We are so excited to continue developing our shows in the coming week! Session Four, Day Four: Talent Sharing & Play Devising! We had a busy day at camp today! Teens began their day learning music with Gaylan, while kids jumped right into devising. Afterward, kids learned music while teens brainstormed and created an outline for their play. Both plays are beginning to take shape! One revolves around a giant wacky family, and one will discuss themes of popularity and what it means to be different. KidsAct! was able to begin working on our “story mountain” and identify various scenes which we will put in our play. TeensAct! was able to come together and agree on an idea and theme which everyone is super excited about! We wrapped up our day with a talent share– we saw many wonderful talents, including singing, dancing, art. writing, and even unicycle-riding! Without a doubt, our talents will help us dream up two amazing shows! As we approach the end of week one, we can’t help but get excited about how our plays will evolve over the next week… stay tuned! 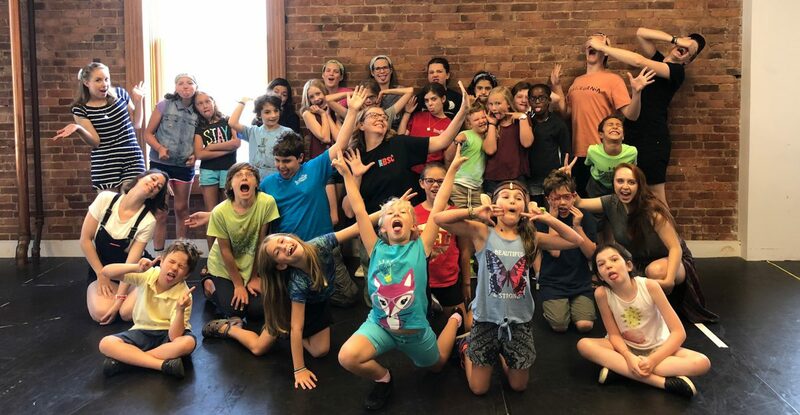 Author barringtonstagekidsactPosted on August 9, 2018 Leave a comment on Session Four, Day Four: Talent Sharing & Play Devising! Barrington Stage Company Camps WordPress.com.